Welcome to MyBinding video. If you are looking for a fun, new and exciting way to enhance your photos and documents, you’re in luck. These wonderful pizzazz decorative laminating pouches are a wonderful attractive frame for your photos, documents and certificates. 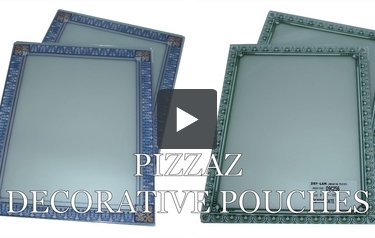 Choose a design from our selection of pizzazz fun frames and classic frames. Give us a call and our dedicated staff can help you find exactly what you’re looking for. Every pouch has a great description page and, often times, a video to see it more clearly. These pouches are 3 mil in thickness and designed to work with almost any pouch laminator. Check out these great pizzazz pouches yourself. When image matters, MyBinding.